Masked soldiers in armored vehicles stand on every street corner as drones fill the sky above them monitoring for any signs of resistance. Giant walls and militarized zones separate families as citizens struggle to survive in near chaos, fighting each other for limited resources. 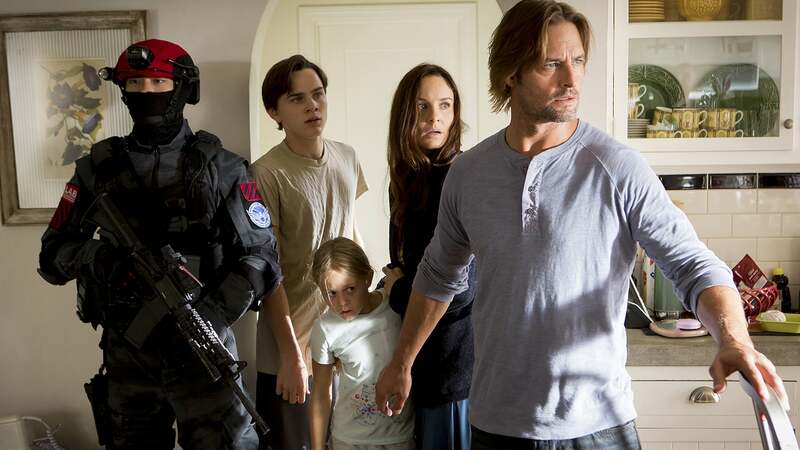 No, this isn’t occupied Palestine or Afghanistan, it’s downtown LA under control of a mysterious otherworldly force in “Colony.” This show from the USA network is a smart and thrilling new sci-fi show just starting its second season. The show follows former FBI agent Will Bowman (Josh Holloway), his wife Katie (Sarah Wayne Callies) and their three children as they struggle with life under the constant threat of imprisonment and forced labor. The family originally hides to avoid the Stalinist-style purges when the invading force first takes control of the planet. However, after Will’s identity as a highly trained FBI agent is discovered, he is recruited by the occupation authorities to track down the leaders of a resistance movement that has sprung up. Despite his reservations about acting as a collaborator and betraying his own species, Will turns out to be a little too good at his job. He quickly zeroes in on the resistance and begins to chip away at its operations. Soon, both Will and Katie are pulled into a deadly, colonial-political game, manipulated by the scheming governor (Peter Jacobson). Ultimately, Will Bowman discovers that his work may end up destroying his family rather than protecting it. His children become increasingly distant as his marriage is in danger of collapsing under the weight of all the lies and mistrust. The casting choice of both the male and female leads was a risky one by the producers. Both Holloway (Sawyer from “Lost”) and Callies (Lorrie from “The Walking Dead”) are known for playing characters who fans love to hate. While, individually, they are fantastic, in scenes together they often lack chemistry, and it becomes difficult at times for the viewer to separate their old roles from the new. One thing “Colony” does particularly well is limiting our information, condensing a sort of intergalactic war into a tight, character-driven show. We never actually see these aliens who now control part or all of the planet, just their ever-present drones buzzing around the sky. We don’t know what life is like outside the colony, or what the aliens’ ultimate plans are for humanity. Despite being a different genre, “Colony” has other comparisons to the aforementioned “The Walking Dead,” as the true villains in both are humans themselves. The alien overlords, just like shambling zombies, become more of a backdrop, a sort of omnipresent evil that dominates the lives of the remaining inhabitants. In both cases, the characters are often shocked at how quickly they can personally adapt, and often thrive, in this cruel new world. With shades of “Blade Runner” and “Law and Order,” USA network’s sci-fi drama, “Colony,” is a great new show with a wide appeal. Its stories of occupation, mass surveillance and brutal oppression mirror the complicated world we live in today.